Technological innovation and the associated institutional reforms are emerging as critical forces in Africa’s long-term economic transformation. As a result, they are increasingly receiving high-level policy attention at the continental, regional, national and sub-national levels. The aim of this lecture is to outline strategies for enabling Africa to harness the power of platform technologies for the technological catch-up and leapfrogging needed to spur economic development and prosperity. It argues that fundamental policy reforms will be needed at all levels of economic governance to enable Africa benefit from emerging platform technologies. It stresses investments in technology search, infrastructure, higher technical training and entrepreneurship. The lecture draws on the speaker’s draft book, How Nations Succeed: Innovation, Entrepreneurship and Prosperity. Calestous Juma, a national of Kenya, is an internationally recognized authority on the role of innovation in economic development. He is Professor of the Practice of International Development and Director of the Science, Technology, and Globalization Project at Harvard Kennedy School. He also directs the School’s Agricultural Innovation in Africa Project funded by the Bill and Melinda Gates Foundation and serves as Faculty Chair for the School’s Innovation for Economic Development Executive Program. Juma co-chairs the African Union’s High-Level Panel on Science, Technology and Innovation and was on the judging panel of the Queen Elizabeth Prize for Engineering. He is a former Executive Secretary of the UN Convention on Biological Diversity, founding Executive Director of the African Centre for Technology Studies in Nairobi and Chancellor of the University of Guyana. Juma is currently a member of the board of the Aga Khan University and other international organizations. He has been elected to several scientific academies including the Royal Society of London, the US National Academy of Sciences, the World Academy of Sciences, the UK Royal Academy of Engineering and the African Academy of Sciences. Juma holds a DPhil in science and technology policy studies from the University of Sussex (UK). He has received several international awards and honorary degrees for his work on sustainable development. Juma’s latest book, The New Harvest: Agricultural Innovation in Africa, was published in 2011 by Oxford University Press. He is working on two books: How Nations Succeed: Innovation, Entrepreneurship and Prosperity and Suppressing Innovation: Technological Change and Its Enemies. 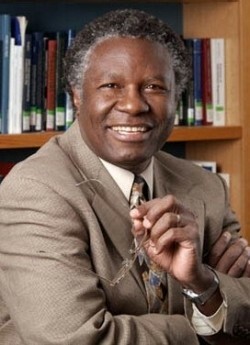 You can follow him on Twitter @calestous or email: calestous_juma@harvard.edu.